Custom NPC Mod is finally updated to the latest version of Minecraft. 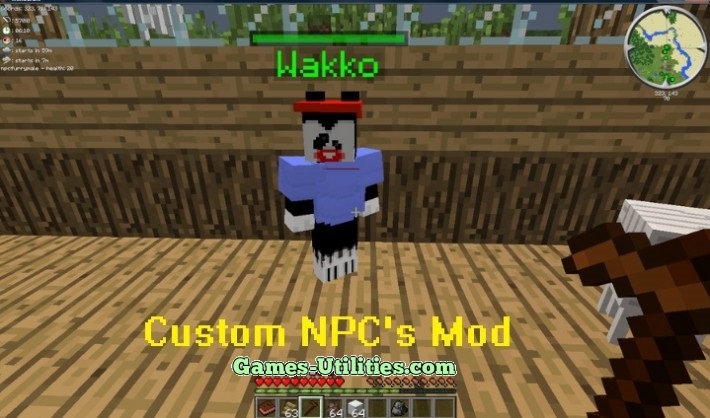 Custom NPC is modification for both Single and Multiplayer that adds non-player characters controlled/programmed by you. You can use NPC’s to fill your world, they act like villagers, citizens. They can perform tasks for you such as Mining, Smelting and farming. Description: Adds AI Characters in Minecraft world. – Go to Start Menu > Run > Type %appdata%/.minecraft and press Enter. – Download and install Minecraft Forge Universal. – Now open Minecraft.jar using WinRaR or 7zip. – Extract the Forge universal files into Minecraft.jar root and delete META-INF folder. – Launch Minecraft to see if Forge is installed successfully. – Download Custom NPC mod zip file (don’t extract it) and place it in .minecraft/mods folder. – Custom NPC mod will be installed, Launch Minecraft and enjoy. • Custom NPC supports LAN/MP/SP. • Back-up your saves before installation. • Custom textures can be added in .minecraft/saves/your world/customnpcs/mob folder.